Home » » COMPETITION: Win The Chance To Attend The 'Mockingjay - Part 2' London Press Conference! COMPETITION: Win The Chance To Attend The 'Mockingjay - Part 2' London Press Conference! The Hunger Games: Mockingjay Part 2 arrives in UK cinemas November 19 and we’re giving one lucky winner and their plus-one the chance to join us at the final press conference for the franchise in London on Friday November 6th. During this once in a lifetime opportunity, you’ll be in the room for some exclusive Hunger Games chats with the cast! Which district does Jennifer Lawrence’s character Katniss Everdeen hail from? Simply email your answer, along with your full name, date of birth, and contact telephone number to competition@quarterquell.org. May the odds be ever in your favour! The competition closes at Noon on Monday November 2nd, and is open to UK residents aged 16+. 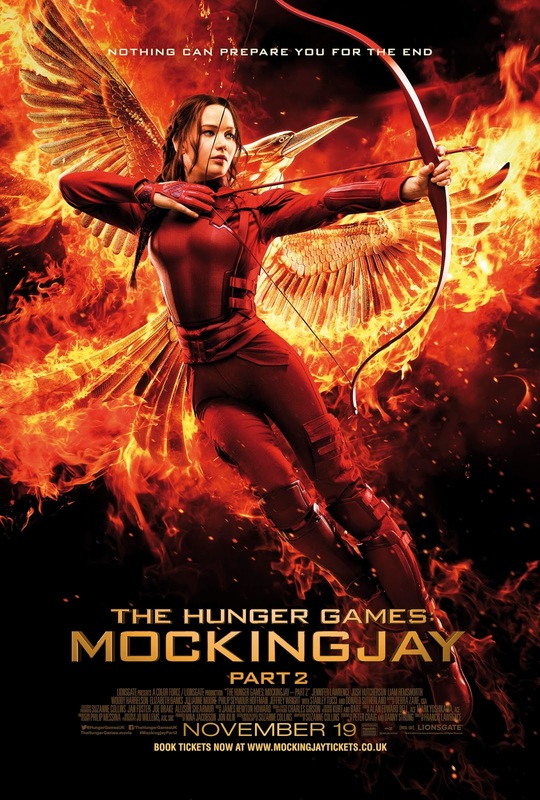 Click here for more information on The Hunger Games: Mockingjay Part 2. Competition closes on Monday November 2nd 2015 at 12:00 GMT. The Promoter is Lions Gate International (UK) Limited of 5th Floor, 45 Mortimer Street, London, W1W 8HJ (Company No. 08936180). The competition is run in association with Quarter Quell. Entrants must be aged 16 or over and resident in the UK. Proof of age and residence will be required to receive the prize. This competition is not open to employees of Lions Gate International (UK) Limited or Quarter Quell or associated agents of those companies or anyone else professionally connected with this competition. Only one entry per person will be considered. Entrants will need access to the internet to enter the competition. Proof of submission shall not be proof of receipt. Entries that are incomplete, incorrectly filled in, illegal, illegible, in the incorrect format or fraudulent or those not received in accordance with these Terms and Conditions will be deemed invalid and not accepted. The Promoter does not accept any responsibility for technical failures which prevent an entrant from submitting an entry and no responsibility will be accepted by the Promoter for entries lost, corrupted or delayed in transmission. Prize for 1 (one) winner is two (2) seats at the UK press conference of The Hunger Games: Mockingjay Part 2 in London on Friday November 6th 2015. The winner will be picked at random and contacted by a representative of Quarter Quell by email/telephone provided on entry. The winner will be required to participate in a phone call with a Quarter Quell representative to vet the winner’s eligibility to attend the press conference. If the winner fails to respond within 24 hours of notification, the prize will be forfeited and an alternative winner will be contacted. By entering the competition, the winner confirms that they are free to attend the press conference from 9am on the day of the event. The time and venue of the press conference may change last notice and reasonable notice will be given to the winner where possible. If the winner is aged under 18, they must be accompanied by a parent/guardian to the press conference or obtain written consent from a parent/guardian for another adult to accompany them. No one under 16 will be admitted. Entry to and attendance at the press conference is subject to respectful and appropriate behaviour. The Promoter reserves the right to deny the winner and their guest entry and revoke their attendance at the event should they behave inappropriately. Cast members in attendance (if any) will be announced shortly before the press conference begins. The winner and their guest will remain under supervision of the journalist representing Quarter Quell at the press conference. The winner will NOT have the opportunity to meet the cast. The winner will be allowed to submit one (1) question to the Promoter prior to the press conference for approval. If approved, the winner may be permitted to put their question to the panel. Questions are subject to press conference schedule restrictions. Not all attendees will be able to submit their question. Travel and accommodation are not included in the prize. In the unlikely event that the press conference is cancelled, no alternative event will be arranged and no alternative prize will be available for the winner. The Promoter reserves the right in exceptional circumstances to vary, amend or withdraw this competition on reasonable notice. There is no cash or other alternative to the prize stated and the prize is not transferable and no part of the prize may be substituted for other benefits, items or additions. The prize may not be sold, offered for sale or used in connection with any other competition or promotion by the winner. By entering the competition, the winner gives consent for their name, contact number and address to be passed to a third party provider for delivery of the prize. Save for the exception above, the Promoter will not pass any personal data to any third party unless required to do so by law or an appropriate regulatory authority. The Promoter will not be responsible for failure to deliver the prize caused by the delivery/postal service. By entering the competition, entrants are sending their personal information to the Promoter who will at all times process an entrant’s personal data in accordance with the UK Data Protection Act 1998 and applicable laws. To the fullest extent permitted by applicable law, the Promoter assumes no liability for any claim, loss or damage arising (whether directly or indirectly). Entry into the competition constitutes acceptance of these Terms and Conditions. The name of the winner will be announced on the Promoter’s website and may be obtained for three months after the competition close date by sending a signed handwritten request along with a stamped self-addressed envelope detailing your request to the Marketing Team, 5th Floor, 45 Mortimer Street, London W1W 8HJ and marked with the name “The Hunger Games: Mockingjay Part 2 Press Conference Competition Winner”. These Terms and Conditions will be governed and construed in accordance with the laws of England and Wales and is subject to the exclusive jurisdiction of the English courts.